Dimitar Danchev turned over a massive chip deficit in the Heads-Up of the PCA Main Event to become the first Bulgarian poker player to capture an EPT Title. 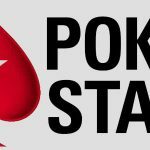 In contrast to the previous five days of quick-fire action – including two in which the tournament was brought to a premature close in order that it did not run out of players – the climax of the PokerStars Caribbean Adventure Main Event was gruelling. 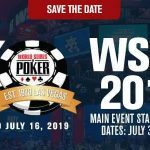 Eight players took their seats at the start of Day 6 – each with hopes of capturing the $1.85 million first prize, but six of them wondering how they were going to overturn the massive chip advantage of USA Poker players Jerry Wong and Joel Micka. 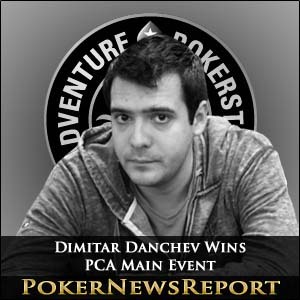 Dimitar Danchev wasted no time in improving his position among the chip counts. The Day 4 chip leader flopped the nuts flush (A♣ Q♣) in only the fourth hand of the day and was able to double up against Jerry Wong (K♣ K♥). Danchev then got Andrey Shatilov to fold against a pre-flop four bet shove to pick up another half million chip pot including the blinds of 40K/80K. Shatilov got some of his chips back when becoming the second player to double up against Jerry Wong (9♠ 8♠ > A♣ Q♠ – Shatilov turned a straight, Wong shoved before the river with Ace High), but then himself doubled up Yann Dion in a A♥ Q♠ > A♠ J♦ race. It would have made a fantastic “Moneymaker-esque” story had the 21-year old air conditioning fitter from Portugal – who started the road to the PCA in a $1.10 SnG – gone on to win the PCA Main Event, but it was not to be. After getting crushed in a K♦ K♠ > 9♥ 9♠ race against Owen Crowe, Joao Nogueria got the last of his chips in with A♦ 6♣ against Joel Micka´s Q♥ Q♦. Despite hitting the 6♦ on the flop, the board provided no further help for Nogueria, and he left the tournament in eighth place. Yann Dion also found himself behind after initiating the pre-flop action. Shoving from UTG with A♥ 9♣, he found himself up against Jonathon Roy´s A♣ K♣ and, although the flop offered the recent winner of the FTOPS Main Event hope of a gutshot straight, Roy went on to complete a flush draw and eliminate Dion in seventh. In the space of 30 minutes, Jerry Wong went from short-stack to chip leader with a double-up and three knockouts. The double-up came against Andrey Shatilov, when Wong´s A♦ K♥ was too good for Shatilov´s A♠ 5♠. 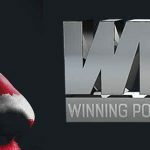 Wong (A♦ K♣) finished off Shatilov (J♣ 8♣) and took out Owen Crowe (A♥ 9♣) in the same hand when all three players failed to connect with the board, and then ended the hopes of Jonathon Roy (7♥ 7♦) when flopping a pair of Jacks to eliminate the WPT Montreal Main Event winner. Dimitar Danchev became far more active as the tournament entered Level 31 (blinds 60K/120K – ante 10K). Picking up a 2 million chip pot against Joel Micka when he rivered a wheel to best Micka´s flopped set of Deuces, Danchev then took 2 million chips from Jerry Wong when pairing his Ace (A♦ 4♠) on the flop against Wong´s 8♠ 8♥ and followed that up by forcing Wong out of another 2 million chip hand after flopping a nut flush. Having started the day with a commanding chip lead, lost most of it and recovered to regain the chip lead, Jerry Wong was eventually eliminated in third place. Much of the damage was done when Joel Micka (K♦ 8♦) hit a better two pair than Wong (10♦ 8♥), but the deciding hand came just before the dinner break. 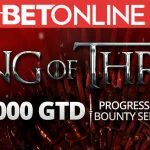 After calling Wong´s (A♦ Q♦) three-bet pre-flop raise of 650,000, Micka (8♥ 6♥) raised Wong´s bet of 725,000 after the flop of A♥ K♣ 5♥ to force Wong all-in. Jerry Wong was ahead with his flopped pair of Aces, but the 8♠ on the turn gave Micka more outs as he pursued his flush draw. Incredibly the 6♦ was dealt on the river to give Micka a huge chip lead going into the heads-up and eliminate Jerry Wong in third. Despite winning one small hand when turning a set against two pairs, most of the chips during the early stages of the heads-up went in the direction of Joel Micka. Needing a double-up to prevent being swamped by Micka, Danchev took a chance with 2♣ 2♦ and was called by Micka (A♦ K♠). The deuces held and the players were on level terms. The lead flip-flopped through the rest of the level until Danchev (J♠ 8♦ chasing a diamond flush) rivered a pair of Jacks against Micka´s (K♥ 10♣) flopped pair of Tens to take a 3:1 chip advantage. Micka tried to grind his way back into the tournament, and some unanswered shoves enabled him to get within 8 million chips of Danchev. However, after a heads-up lasting almost three hours, a final shove with 4♥ 4♦ was met with a call by Danchev (A♦ Q♥) and the cards were laid on the table. After picking up the trophy and winner´s cheque for $1.85 million, Dimitar Danchev admitted that this had been one of the toughest final tables he had ever competed on and had to battle the demons of coming second to Andrey Pateychuk in last year´s EPT San Remo after taking the chip lead during the heads-up.